PGA Tour commissioner Jay Monahan met with the media on Tuesday to announce sweeping changes to the FedEx Cup regular season and playoffs, which will begin next year. Highlighted by a simplified scoring system for the Tour Championship and several millions more in prize money, here's what you need to know about the changes: Wyndham Rewards will now sponsor a new $10 million program called the "Wyndham Rewards Top 10." The Wyndham Championship is the last regular season event on the PGA Tour schedule, and the top 10 players in the FedEx Cup standings through the Wyndham will collect big bonuses. The leader gets $2 million, second takes $1.5 million and the golfer in 10th place receives $500,000. The FedEx Cup Playoffs will be reduced from four events to three. The top 125 players will compete at the Northern Trust, with 70 advancing to the BMW Championship and 30 to the Tour Championship. While this was more or less an open secret when the new schedule was released, the format for the Tour Championship has been completely overhauled. 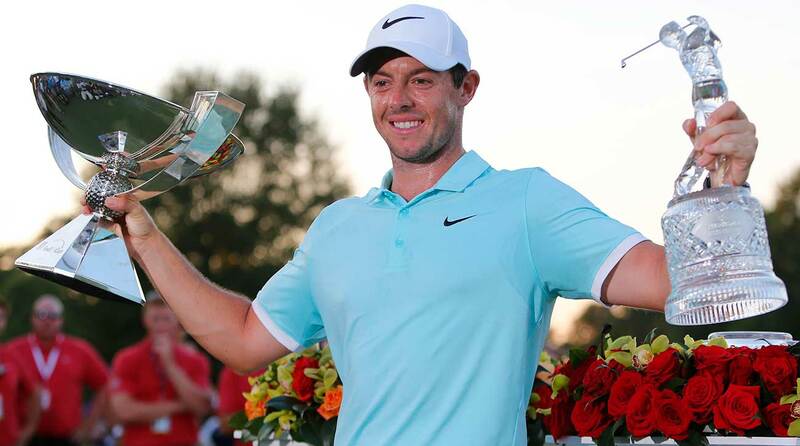 Rory McIlroy celebrates winning the Tour Championship and FedEx Cup title in 2016. The Tour Championship at East Lake in Atlanta previously used to use a points reset, but starting in 2019 the Tour will use a strokes-based bonus system for all 30 players in the field. The FedEx Cup points leader through the BMW will start the Tour Championship at 10 under, and the other 29 players will be assigned scores according to their standing. The format is below. 1st : -10 2nd: -8 3rd: -7 4th: -6 5th: -5 6th to 10th: -4 11th to 15th: -3 16th to 20th: -2 21st to 25th: -1 26th to 30th: E If the system was in place for this year, for example, FedEx Cup leader Bryson DeChambeau would begin he Tour Championship at 10 under, while Tiger Woods (who is 20th in the standings), would start at two under and eight off the lead. This new format will crown one champion come Sunday night, as the winner of the Tour Championship will also win the FedEx Cup title (and its massive bonus). This change prevents the awkwardness of honoring two winners — a Tour Championship winner and FedEx Cup winner — when the tournament finishes. "As soon as the Tour Championship begins, any fan — no matter if they’ve followed the PGA Tour all season or are just tuning in for the final event — can immediately understand what’s going on and what’s at stake for every single player in the field," Monahan said in a release. "And, of course, players will know exactly where they stand at all times while in play, which will ratchet up the drama, consequence and volatility of the competition down the stretch. Compared to the current system, the beauty here is in the simplicity." The FedEx Cup bonus pool also gets a dramatic boost, increasing by $25 million to $60 million. Starting next year, the FedEx Cup winner will take home $15 million, up from $10 million.